David Reidy, a former South Oxhey resident [1948-69], has been editing a fairly substantial history of the Estate for the past eighteen months. It includes many unpublished pictures, maps, diagrams, etc. The book will be launched on Saturday, 30th June 2012 between 2 and 5 p.m. at All Saints Church in Gosforth Lane, Mr David Gauke MP has kindly agreed to attend. Everyone welcome. This page was added on 25/01/2012. Copies of the book are still available from David Reidy. His contact details are as above. The book costs £20 . It is sold in the local cafe 26 Little Oxhey Lane. Went on a memory lane visit to South Oxhey today. Went in the library and found this book which upon reading found that I was actually in the book which amazed me. I immediately sent an email to David Reidy once I got home to purchase a copy. Hello Alison, to get a copy of this book please contact David Reidy, his telephone number and e.mail address appear under the book information on this page. Where can I get a copy of this book from please? What an amazing book, full of nostalgia. We moved to South Oxhey in 1958/9. I enjoyed your book immensely. Thank you. I was so pleased to hear that David’s book about Oxhey had a successful launch and I will be making contact to purchase a copy. I also noticed the comment from Margaret Davis nee Ravening as we were in the same class at Hampden School she lived just around the corner to me. Firstly, may I say how much I enjoyed travelling down from Co.Durham to participate in the launch of Poor but Proud. Thanks for the kind words, Neil-good to see you again! I wonder if Bob Battaglia is a relation of the former Italian prisoner-of-war, who used to come and cut the hair of the Swain household in Hayling Road throughout the 1950s? A lovely fella, to be sure, and I think I taught one of his daughters at Clarendon School in 1962. Small world, ain’t it? Oops sorry should have read above first..so eager to get a copy !! Can someone please tell me where I can buy a copy of this book…having grown up from 1950 on the estate I am extremely interested in owning a copy! Hi David, I had a phone call from my sister saying that you had written this book and I intend buying it. Well done, it really looks a ‘must read’ for those who went to live there, we were offered a house because Pat one of the twins was left with a damaged lung after whooping cough at 6 months, the Doctors said the good clean air would help a good recovery. 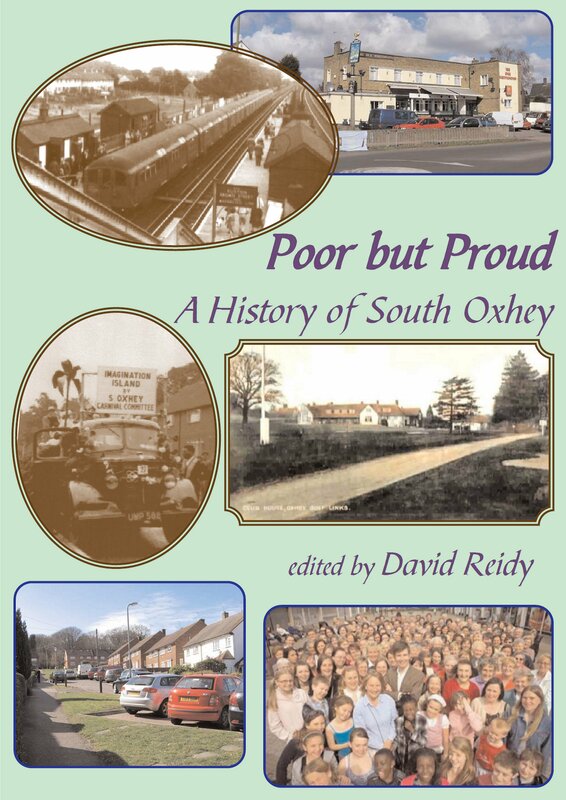 This is a book really worth reading, for anyone who lives or has lived in South Oxhey or has an interest in the area. Thankyou David, I really enjoyed reading it. Some lovely early photographs that I had not seen before. A real trip down ‘Memory Lane’.